Records uncompressed 16-bit PCM .wav files at 44.1 kHz or 48 kHz. IF YOU ALREADY OWN A MARANTZ PMD560 YOU MAY STILL PURCHASE SOME OF ITS ACCESSORIES FROM OUR PMD560 WEBSHOP BELOW. In effect this is a non-portable version of the Marantz PMD660 in most respects. A low cost, entry-level, solid state recording facility in your rack. And it only takes up 1U of rack space. By storing audio data on Compact Flash (CF) media cards, all of the mechanical hassles of tape recorders are gone forever-as are the costs of servicing and maintaining them. Not only that, but CF storage allows you to choose different recording formats, and makes transferring audio files to computers a snap. No more flipping tapes! A single 1Gb flash card can hold up to 36 hours of uninterrupted audio (monaural .mp3 at 64 kbps). For music recording, the same size card can hold more than 17 hours high-quality compressed stereo (.mp3 at 128 kbps). If you need CD or better then CD quality uncompressed audio, you can get about one 1.5 hours worth of 16-bit linear PCM (WAV) audio at 44.1 kHz or 48 kHz on a suitable 1Gb card. Using older technology, preparing your final product was a pretty involved process, sometimes meaning multiple steps of transfer and format conversion. With the PMD560, you record in the format you need, and easily move that recording to a computer. 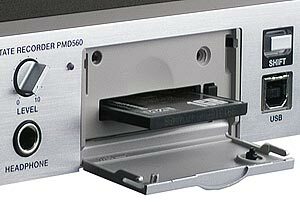 In some cases, it's as simple as pulling the CF card from the PMD560 and plugging it into the card reader on your computer. Alternatively, you can use the USB port on the front panel to transfer audio files to a PC. It's already in your format of choice, so once it's in your computer, it's ready to post to the web, burn to a CD, or edit in your favourite editor. In addition, you can make your edits and playlists right on the PMD560. Its "Virtual Track" mode allows you to create up to 99 virtual tracks (internal playlists of audio segments). You simply tell the PMD560 what segments of a file to play, and in what order, and it does it without altering the original file in any way, and without using up more card memory. Need to webcast part of a meeting to your sales team? Want to play a few interview segments during your presentation? What about podcasting the six best songs from a concert? Editing is easy with virtual tracks.